The Wellcome Trust is the world’s third richest charity so it’s only fitting that their state-of-the-art gallery facilities on Euston Road, London boast a striking centrepiece. 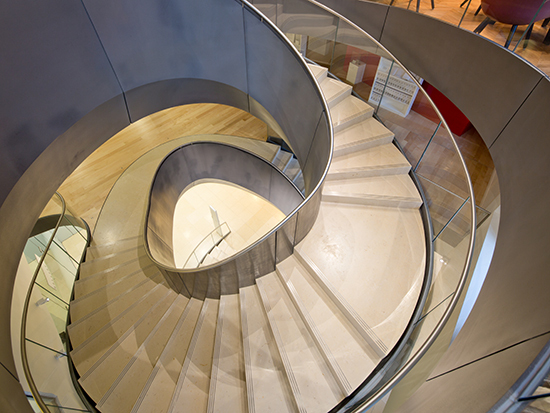 An interior remodelling of the Wellcome Collection was planned in order to create a more welcoming atmosphere and encourage visitors to access the building’s upper floors. 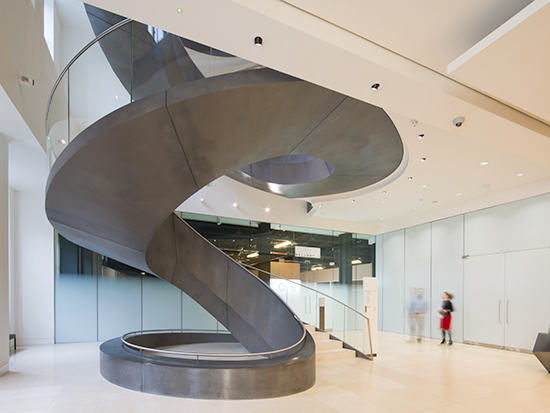 Wilkinson Eyre designed a dramatic, spiral staircase which now takes visitors from the ground floor to higher levels. The stairwell’s unique, continuous spiral design necessitated the help of a glass specialist with the expertise to provide 63 individually curved glass panels, each with a different size, shape and radius. Kite Glass was awarded the contract and went on to create the bespoke glass panels from 21.5 heat soaked toughened laminated glass using AGC Clearvison Low Iron glass with Kurraray specialist interlayer SentryGlas for its structural strength, clarity and post breakage performance. The final product provided the strength and durability in this high-profile building open to the public.